Alain Badiou is among the more vital philosophers alive today. Not that many care. He appears in Godard‘s Film Socialisme delivering a lecture to an empty hall on board a cruise ship (Godard insists he listed Badiou’s presentation on the ship’s social itinerary). 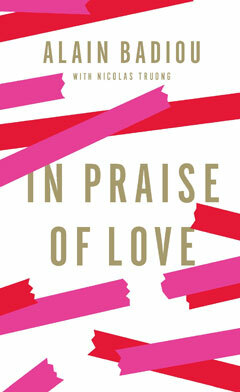 It is worth mentioning this because Badiou references the film project in this book, In Praise of Love, but also because the book draws its title from another Godard film of the same name. Badiou begins the slender — and highly readable — volume critiquing the role philosophers have or have not played in investigating love. He finds the sexless, lonely philosophers who make up a basic course in the field somewhat poor in experience. He calls this a “Two scene.” It is “the idea that you can experience the world from the perspective of difference.” It is something more than the concerns of a single individual. This is a proposition that requires, most fundamentally, a risk. In his own philosophical jargon, mentioned in the book but also explained in plain terms, this initial encounter is an “event” (a concept he laid out in Being and Event [L’ être et l’événement] (1988)). An “event” is something that is only authentically possible when it seems to exceed its causes, a rupture in what seems possible under prevailing norms giving rise to a fleeting subjective decision point about how to experience the world. There is just something likeably good about this thesis. But even if there might be widespread agreement on this point, for Badiou, it is only a starting point. Badiou denigrates the view of love in a typical theatrical play being about and culminating with marriage, the sorts of stories in which the wedding takes place at the end and we are to assume that therefore “love” has been achieved, and is over, complete. He instead, somewhat provocatively, points to Samuel Beckett as “a writer of the obstinancy of love.” Perhaps another example beyond those given by Badiou, within the limited range of Hollywood movies, is the film The Five-Year Engagement (2012), in which the main characters initially try to sort out their lives before getting married only to repeatedly choose to view their lives in terms of a being a couple. Badiou even applies his ideas of love to politics. He sees it as a way to limit identity politics, and “integrate the most extensive divergences” in a kind of internationalism that permits real equality. He contrasts that project of “love” with the “reactionary project” that “is always the defense of ‘our values’, . . . as the only possible identity.” This is his perspective on multiculturalism, and continues his support for secular states in which people of different religions, cultures and ethnicity can live together. Some of the specific examples illustrating the concepts tackled in the book may be highbrow, or at least very French. But Badiou frames his discussion of love in terms that are freed from the contexts of his examples. Badiou’s thoughts on love are at once immediately understandable and uniquely his own. He is most concerned with what sustains a way of subjectively experiencing the world. He sees “love” as an important process for doing so that is more than just a one-time declaration, or a finish line. It is an unstable thing. This is what makes it so vital. Philosophy is all about asking better questions. Badiou is asking questions that confront everyone. He’s put the question forward in a way that has a curious blend of practicality and theoretical weight. Curious readers should give his ideas a chance.